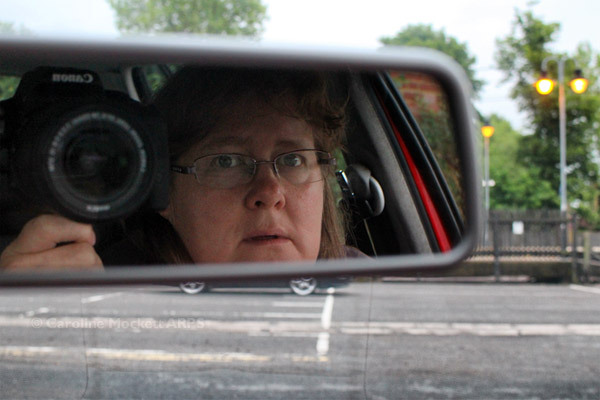 Notes: Rather last minute for this month’s In The Frame shot, but I just managed it. As some of you may have noticed, I’ve been back at my television engineering career for a few months recently. I trained in Electronic Engineering at university and took up a job as a Broadcast Engineer at the BBC once I graduated. I’ve always been interested in how things work so it was a natural progression for my career path. 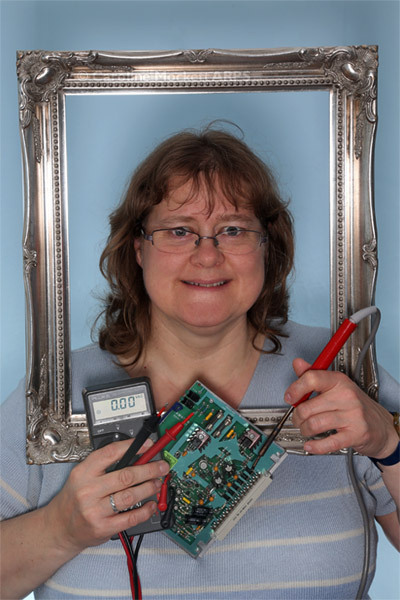 In early 2000, I hung up my screwcrivers and made a jump into software engineering and web development, which I’ve been doing ever since – initially for the BBC and later as a freelancer. 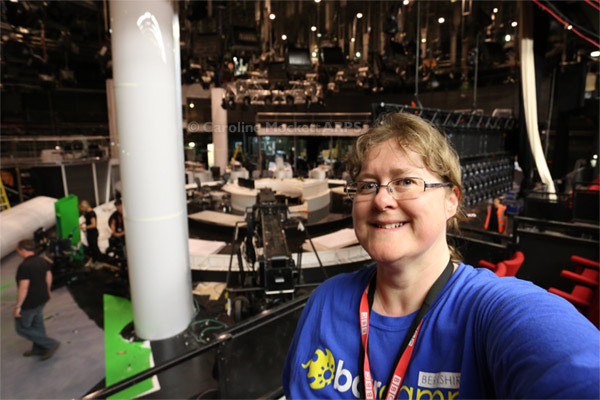 In 2010 I had the opportunity to go back to the BBC as a freelance engineer for their General Election coverage and have been doing various stints of contract work for them in subsequent years. It seems like you can never hang up the screwdrivers forever! One for Treasure Hunt Theme #05 – Once A Month, May. Notes: So tired today. The end of 8 weeks work (and 12-days of consecutive shifts, including two overnights) at the BBC. I’m dead. 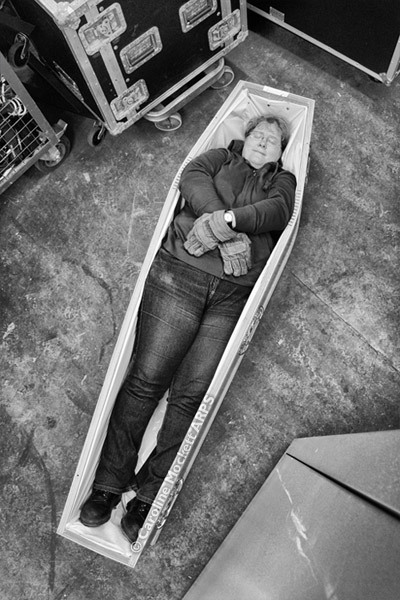 And in case you’re wondering, my colleagues found this coffin in a skip – it was a prop for a recent TV show. We thought we might be able to use it for storage! Notes: This evening, Motor Sport Photographer Peter de Rousset-Hall came to give a presentation at our photography club. He brought along some excellent images and showed us his kit. 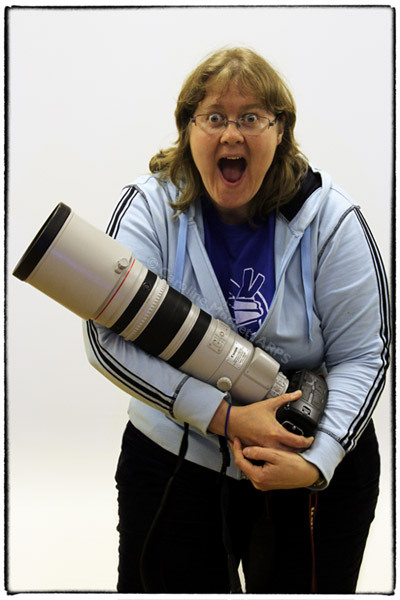 This is his latest acquisition, the Canon 200-400mm f/4 L IS USM with internal x1.4 extender. He kindly let us all have a look at it – but it wasn’t until I got home I found out this was over 10-grands’ worth of glass! I was eternally thankful I handed it back in one piece! Notes: I nearly fell asleep on the train on the way home this evening, so thought I better try and wake myself up a bit before driving home from the station. It’s not a very satisfying result, but hey ho. Notes: A couple of days ago, I was dead on my feet. Today, I was dead on my face, it would seem! 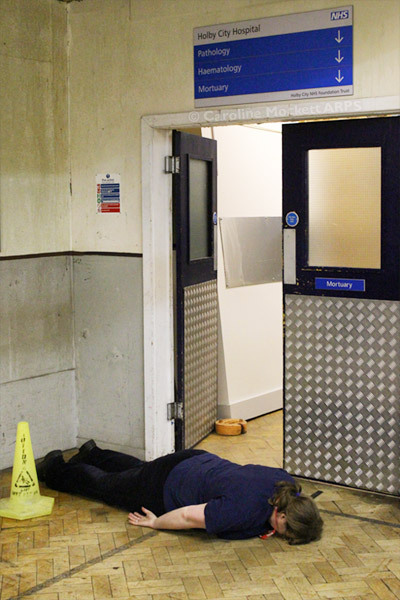 I found another corridor which doubles as a random bit of the Holby City set – with a door labelled Mortuary. So, what else could I do other than a quick Face Down Tuesday? Notes: I grabbed a few minutes to myself for a picture while we were clearing up in the studio. 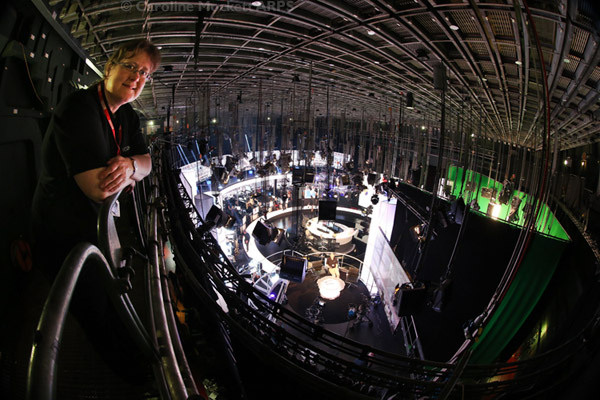 Notes: You get a good view of the whole studio from the gantry and my fisheye lens emphasised the perspective to dramatic effect. You also see the lighting hoists at close quarters, a great fit for the current 52 Weeks theme, Mechanical.